Jaipur : The flagship event of the internationally acclaimed Gemstone and Jewelry Industry of Jaipur, The 9th“Jewellers Association Show - JAS-15” will be organized from 21st to 24th of August in city’s Jaipur Exhibition and Convention Center (JECC) in Sitapura Industrial Area. The 4 day mega event is organized annually by the Jewellers Association of Jaipur. According to the Convener JAS-15 Pramod Derewala, and President Jewellers Association Vijay Kedia, JAS has established itself as a trustworthy platform for Business Networking and Buying among Jewellers, Gemstone manufacturers and dealers, Jewelry by-products sellers etc. “The growth in the number of stalls, reserved area of the show and the visitors on year-on-year basis is a good indicator of the increasing popularity and brand of the show”, added Derewala and Kedia. They further added, "JAS-15 has been conceptualized in a comprehensive way so as to accommodate every single need of the Gemstone and Jewelry industry requirement." The show has provided a platform to all – loose and semi-precious colored stones, loose diamonds, Gold Jewelry, Silver Jewelry, Platinum Jewelry, Stone and Diamond embedded Jewelry, Kundan-Meena Jewelry, Thewa- Sozo Jewelry, beaded Jewelry, Artifacts and decorative items produced using Gemstones, Fashion and Designer Jewelry, Fusion and handicraft Jewelry, Gold plated articles, Jeweler manufacturing machinery and tools, publications, accessory all will be showcased under one common platform of JAS-15. Apart from this a large number of stalls will also be displaying Rough Gemstones as well. 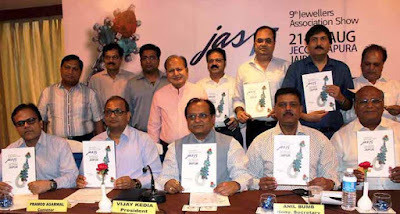 According to Secretary Jewelers Association Anil Bumb, the growing reach and extent of the show is affirmed by the fact that more than 500 stalls and pavilions have been booked in JAS-15 compared to only 330 in JAS-14 and owing to this the reserved area for the show has also been increased to 4500 sq.mts from last year’s 2700sq.mts. “The increasing size and the international exposure of the JAS-15 have inspired us to organize the show in Jaipur Exhibition and Convention Centre (JECC) for the very first time”, added Bumb. JAS-15 Co-Convener and Spokesperson JAS-15 Alok Sonkhia added, the change in the venue will be accompanied with a complete facelift of the show presentation as well. JAS-15 will be presented in a new avatar with added facilities for the visitors and participants. The internal architecture of the show, the business lounge and the other areas of the show will depict the rich heritage of the Jaipur city including the epic “Chaupar’s”, the Jaipur’s trademark “Baramada’s” etc. The complete information repository of the JAS-15 “The Show Guide” is also under development which will contain detailed information about all the participants. Additional facilities will be provided to the outstation visitors, associations and delegations. Sunil Jain, Member Organizing Committee said that, the 4 days of the show will also have various entertainment and business networking events. The first and the third day evening of the show will have Business Networking over Dinner to foster friendly and supportive business relations. The second day of the show will have a grand fashion show while the fourth and last day of the show will have a Felicitation ceremony. Jain added that a new and interactive website for JAS-15 has been released. Apart from this JAS-15 has been widely promoted on various popular social platforms like facebook, twitter, whatsapp, messaging etc. Such initiatives were also appreciated in the recently concluded IIJW, Mumbai. “Owing to such initiatives more than 3500 online registrations have already been done”, added Jain.